At five years old, Geoff Sobelle was “obsessed with becoming a magician” but devoted himself to theater upon adolescence. Fast forward a few years, however, and his work still contains magical elements; the artist now describes himself as a “dedicated absurdist […] chiefly interested in moments of ‘the sublime ridiculous. '” His most recent work, The Object Lesson, is an enchanting and immersive experience about our relationship to clutter. Before Sobelle’s performance in The Object Lesson begins, the audience is ensconced in a disorderly fortress of boxes, free to rummage through the piles. Sharpie scrawlings designate their contents, such as “acorn collection,” “red things,” or “tetanus.” In due time, Sobelle takes command of this journey, inviting participants to contemplate the surreal and charming qualities surrounding possessions, nostalgia, and—in the most literal sense—stuff. In anticipation of a series of six performances in the Walker’s McGuire Theater this week, Mr. Sobelle was kind enough to provide some background on the creation, assembly, and interactive nature of the project. What was the spark behind this project? What sort of research did you then do to fully construct the piece? The development of The Object Lesson has been organic. I have long been fascinated by our need for “stuff,” and I knew I wanted to create a work that gives the audience an immersive experience. The Object Lesson actually originated in a drastically different form. The original workshop exploration in 2012 existed on an enormous pile of dirt, from which objects emerged. I collaborated with Steven Dufala, an artist who specializes in sculpture and installation art. We had previously worked together on rainpan43’s Machines, machines, machines, machines, machines, machines, machines. Following that workshop, I was commissioned to create a live theater work for LCT3 at Lincoln Center. I was still fascinated by the “object” concept, but LCT3 wouldn’t let me put an enormous pile of dirt onstage, so Steven and I started exploring other ways to create an immersive experience within a more conventional performance space. Additional collaborators joined the creative team: director David Neumann, sound designer Nick Kourtides, and lighting designer Chris Kuhl. After LCT3, the first installation version of The Object Lesson was performed at the Philadelphia Fringe Arts Festival in 2013. You’ve sourced objects for this performance from Recycled Artist In Residency in Philadelphia. How did that relationship come about? We’ve been so lucky to get to pull materials for this show from Recycled Artist in Residency (RAIR). From the start, a core principle of The Object Lesson was to not have “new” objects in the space. Early on, almost all the objects came from my basement, then my parent’s basement, but as the project grew in scale, we needed more than just my stuff. RAIR was co-founded by Billy Blaise Dufala, Steven’s brother, and he offered to help us out—and be on the lookout for some of our most desired objects. RAIR is a really incredible organization, and they really helped us to create the scale of installation we wanted. With so many boxes, have you ever been surprised by the objects brought out during a performance? Are there any particular objects you’re still waiting for someone to interact with? I’m pretty aware of every object in the space. We have about 200 “curated” boxes that are labeled and contain a selection of objects based on a theme or idea. Since we’re inviting audiences to explore the space, items are constantly getting moved about as people take something they’ve discovered across the room to show their spouse or friend. And we’ve had more than a few objects go missing, only to have them turn up days later. I love seeing how people interact with the items in the space—and the ways they do are constantly surprising me. Does having the audience onstage and in close proximity change anything for you as a performer? How have you constructed or changed the piece to accommodate that? What is exciting about that encounter for you? I’ve been interested in the line between theater and performance art for a while. 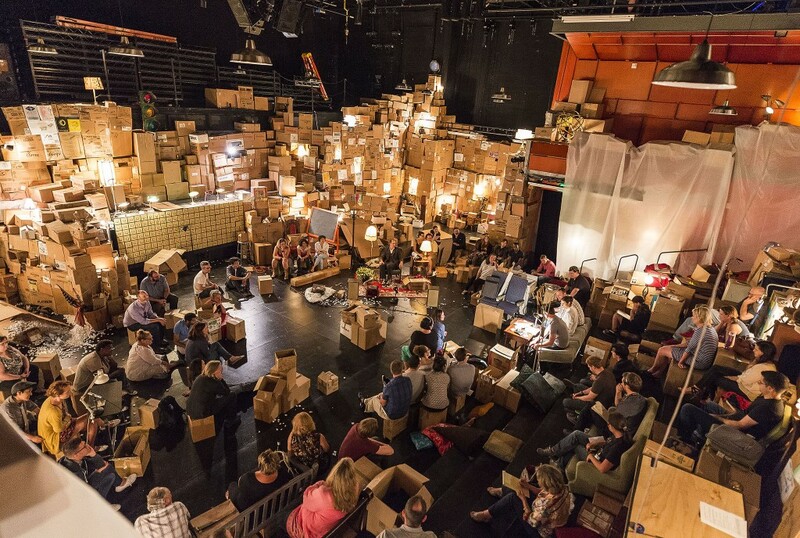 This work, which invites the audience to open boxes, pull out objects, and create their own seating (from cardboard boxes, naturally), brings a life, breath, and spontaneity that is harder to find in traditional theater work. Each and every performance of The Object Lesson will be different because it is changed by the audience in the room that night. For me, sometimes it becomes slightly harder to navigate the space, but I’m also drawing energy from having everyone so close. It makes the work more personal. What do you think would be different about this piece if you had staged it at a different time in your life? Has the performance allowed you to reconsider the values of the objects in your own life? As the installation was being created, I realized that because so many of the objects came from my life, my childhood, there was a specific experience that someone around my age would have (kinship with specific toys from a specific moment in the ’80s, for instance). But the installation was created to feel personal and relatable to everyone, and I’ve worked to pull items from different eras so it becomes a universal experience. There are so many different moments in one’s life when they must deal with “stuff.” The accumulation of toys as a kid, the collecting of mementos, moving, moving again, returning to clean out your childhood home. Creating this work has definitely made me more aware of what I choose to keep, or give value to in my life. And who knows, when this is all done, maybe I will become a life-long minimalist! Geoff Sobelle’s The Object Lesson runs November 4–8 at the Walker Art Center’s McGuire Theater, as part of the Walker’s Immerse Yourself, an onstage performance installation series.